“My goals for 2017 are at first to stay healthy over the season and I expect more than last year, especially when taking part in my second grand tour." Patrick Konrad is one of the young talents on the Bora-hansgrohe tam ready to prove the shadows of new teammates Rafal Majka, Leopold Konig and Peter Sagan will stunt their developments. Konrad recently spoke exclusively with CyclingQuotes at Bora-hansgrohe’s pre-season camp just before Christmas. We talked his breakthrough 2016 season and what he is looking at achieve in the future. At 25, he is the oldest of the team’s young climbers, along with former German national champion Emmanuel Buchmann and fellow Austrian Gregor Muhlberger. Konrad spoke about the relationship the trio have. 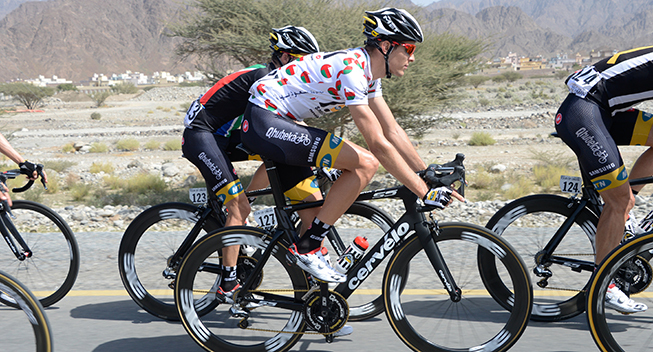 Tour of Oman: Buchmann 12th at 2:30, Konrad 15th at 3:00. Giro del Trentino: Konrad fifth at 0:24, Buchmann eighth at 0:30. Rad am Ring: Buchmann fourth at 1:34, Konrad sixth at 4:02. The duo did many other races together, where one would go for GC and the other would be a domestique. As for Konrad’s season, he assessed it one with many ups and downs, but he has taken a positive balance from his 2016. Konrad did his first Grand Tour as a pro in 2016, and it was the most feared for young riders: the Tour de France. Konrad not only finished the race, but managed a great sprint to take 12th into Berne, a great result for the punchy climber. Naturally, talk turned to the arrival of the three big names the team has secured as they embark on their first season as a WorldTour team: Sagan, Konig and Majka. With the latter duo being climbers who have done very well in Grand Tours, Konrad was understandably keen to learn from them. Konrad showed great growth in both the Classics and shorter stage races. His great riders in Trentino and Oman were supplemented by 14th in Tour de l’Ain and 15th in Liege-Bastogne-Liege, coming in at 12 seconds with the group that went for 7th place, including Valverde, Bardet, Kreuziger, Mollema, Rosa, Gasparotto and Alaphilippe. He will hope to continue this growth in 2017. Konrad and Buchmann are being touted as possible participants in the Giro but could realistically do any of the three Grand Tours. Konrad said he has a similar race schedule to 2016, which means some stage races supplemented by some one-day races, with Trentino and Liege big goals once more.